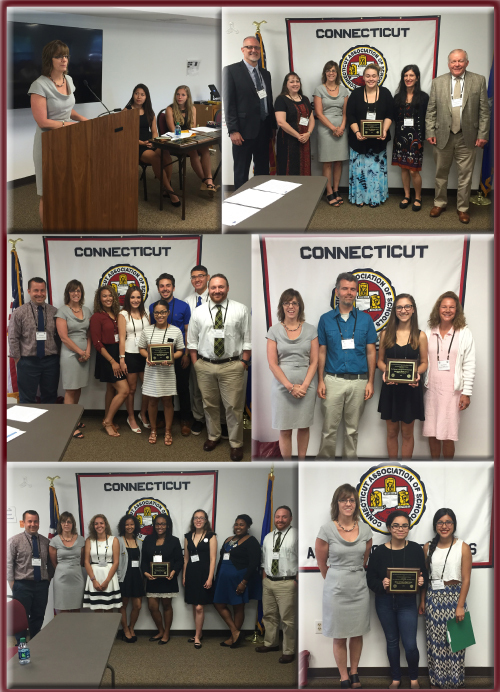 On June 2nd, the CT State Department of Education presented the 2016 Challenge to Educational Citizenship Awards to six Connecticut schools. These awards celebrate student-organized activities that involve service to the school, to the community and/or to those in need. The Challenge to Educational Citizenship (CEC) Award Program began in 1995-96 and is the brainchild of the State Student Advisory Council on Education (SSACE). Projects submitted for consideration must demonstrate good citizenship, a commitment to others, civic awareness, leadership, responsibility and teamwork and should provide opportunities for students to help others. East Hartford and Danbury High Schools each received two CEC awards this year! SSACE members Annie Kuo from Avon High School and Emily Williams from Farmington High School presented plaques to each of the six winning schools. Anne McKernan, Director of Leadership Development for the Connecticut State Department of Education Talent Office, was on hand to offer congratulatory remarks and to pose for pictures with the winners.